Nostalgia's a powerful thing. For little more than a fond memory or two, people have been known to dress up in none-too-flattering costumes and rally at conventions, drop hours per day chatting with like-minded fans, and - of course - spend unnecessary sums of money on items related to the object of their nostalgic affections. Final Fantasy's sheepishly devoted flock of followers, especially, has gained a reputation for loving its series of choice with near-religious zeal. Hell, even at a Star Trek convention you'll still find someone lugging around Cloud's colossal cleaver. So, of course, Dissidia: Final Fantasy's just a quick-and-dirty ploy to make a quick buck, right? Actually, despite Dissidia's tendency to roll up in a van and entice my inner child with all manner of nostalgic candies, its over-the-top, Dragonball Z-esque combat is what really kept me hooked. And that's a bit odd, considering that I'm not really a fan of traditional fighting games. But then, Dissidia is no traditional fighter. Instead, it works like this: Two ostentatiously garbed combatants face off on a completely 3D plane. Lock onto your opponent in order to keep track of him or her as they move around the colossal environment you're brawling in. Once locked on, you're simply a hop, skip, and a dash away from closing the distance between you and your opponent. Coupled with high-flying, blindingly flashy attacks, this movement system makes fights look, well, awesome. 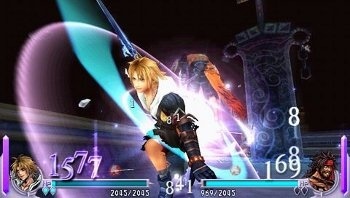 Dissidia's fighters dart and dash about, charging into each other like jousters fired out of cannons and crashing through destructible environments. Remember the fight scenes in Fantasy VII: Advent Children? Well, in Dissidia, you can play them. This doesn't make the game just another mindless button-masher. It wouldn't be a Final Fantasy game without stats and other JRPG tropes, and boy are there plenty of them. In fact, the game's a bit daunting at first, because, while it streamlines much of the JRPG formula, Dissidia somehow manages to contain more head-scratching numbers and acronyms than most traditional JRPGs. The most crucial of these stats - at least, in combat - are hit points and bravery points. Hit points should be familiar enough to anyone who knows that "RPG" doesn't just stand for "rocket-propelled grenade," but bravery points are a stickier subject to master. In a nutshell, they dictate how much damage you can deal to an enemy's HP, but they can also be gained and lost through their own special attack. Generally, your best bet is to open a match by chipping away at your opponent's bravery before moving in for the kill. Dissidia's controls are simple enough, with nary a 42-button combo in sight. Instead, HP attacks are mapped to the square button, and bravery attacks on the circle button. By pushing the analog nub in a specific direction and tapping one of the two attack buttons, you can sling all manner of classic Final Fantasy attacks and spells. As battles wage on, you'll also build up your EX meter, which when full, fuels your screen-devouring, usually fight-ending super attack. Omnislash, Blitz Ace Overdrive, Meteor, and many more round out this category, done up with so much bombast that you'll probably miss the button presses used to wring out their full power because you'll be too busy staring slack-jawed at their beautiful effects and animations.